Ruptured is thrilled to be releasing SAFAR‘s new album this coming Monday at Metro al-Madina, Hamra, Beirut! “In Transit” is a compilation of the band’s first three EPs “23 Kilograms”, “Carry-On” and “Gate 03”. The BUNNY TYLERS is a collaboration between Charbel Haber (Scrambled Eggs, Malayeen, Johnny Kafta Anti-Vegetarian Orchestra) and Fadi Tabbal (The Incompetents, Under The Carpet, Safar), aimed at the exploration of different guitar bowing techniques and celebrating the smell of cold tobacco, cheap aftershave, eternal sunsets and surfer suicides. They will perform at Ono The Music Hub on the occasion of the release of the Bunny Tylers’ first album, “Glitches & Drones 2013-2016”, for Lebanese alternative label Ruptured. Musician, producer and sound engineer, known for his numerous contributions to Beirut’s alternative music scene by way of the specialized studio he opened in 2006, Tunefork. Tabbal’s work as an engineer at Tunefork has secured its reputation as one of the most prominent studios in Beirut; the majority of the city’s alternative acts have passed through its doors. Fadi is a member of several Lebanese bands, including rock groups The Incompetents and Bunny Tylers, as well as experimental trio Under the Carpet. He collaborates frequently with singer/songwriter Youmna Saba, folk bands Safar and Ramly, and is a guest player on albums by oriental duo Praed and folk singer Sandmoon, among others. As a solo artist, he has released three albums entitled “On the Rooftop Looking Up” (Self-released 2013), “Museum of Disappearing Buildings” (Self-released 2015) and “How’s Annie” (Ruptured, 2016). Lebanese rock musician, performer and composer, straddling the uneasy genres of experimental post-rock and ambient soundscapes. Co-founder and member of longstanding Lebanese post-rock group Scrambled Eggs, Haber’s work encompasses a wide range of disciplines and styles including film, video art and theater, both as a solo artist and as a member of Scrambled Eggs, Malayeen and the Johnny-Kafta Anti Vegetarian Orchestra collective. As a solo artist, he has collaborated with various visual artists and composed music for a variety of film and theater performances, both in his native Lebanon and abroad. Haber has released over a dozen albums with Scrambled Eggs (for labels Incognito, Ruptured and Johnny Kafta’s Kids Menu), two solo albums (for Al-Maslakh and Discrepant), as well as several one-off collaborations over a variety of supports including vinyl, CD and cassette. 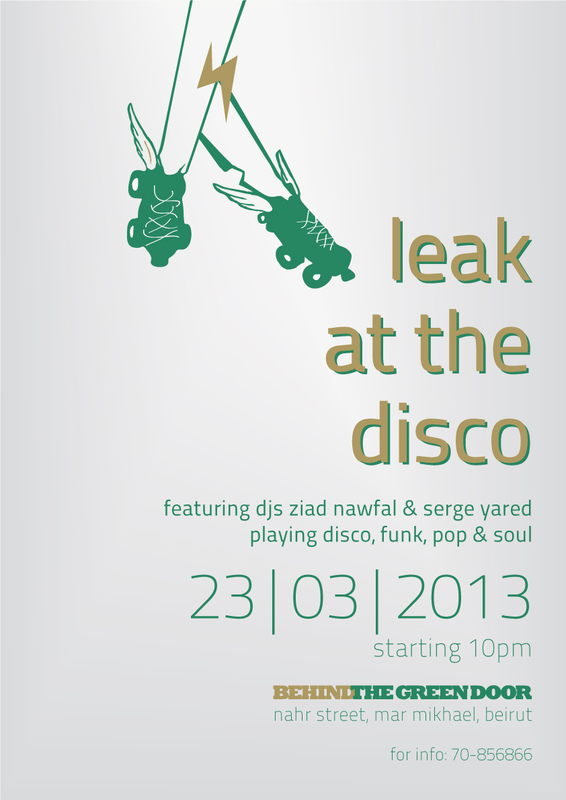 Jawad Nawfal is a pioneer of Lebanon’s electronic/dance scene. Starting out as a DJ and event promoter in the late 90’s, he eventually moved on to production and composition in the early 2000’s, forming live electronic duos Ae_Quo and AEX with Lebanese musician Victor Bresse. Nawfal created MUNMA in the aftermath of Israel’s war on Lebanon in the summer of 2006 — this solo project explores oriental harmonies and rhythmical patterns, with a strong reliance on sampled traditional musical beds and excerpts from politicians’ speeches and radio broadcasts. In 2012, Jawad started working with Lebanese writer and slam poet Mazen el-Sayed aka El Rass, and the two musicians released two well receivedalbums which explore the darker sides of rap, reconfiguring the genre to include elements of bass and electronica. In the following years, Nawfal collaborated with Belgian electronic producer Cedrik Fermont, and released 4 albums on his label Syrphe Records with different contributors. Fadi Tabbal is a musician, producer and sound engineer, known for his numerous contributions to Beirut’s alternative music scene by way of the specialized studio he opened in 2006, Tunefork. Tabbal’s work as an engineer at Tunefork has secured its reputation as one of the most prominent studios in Beirut; the majority of the city’s alternative acts have passed through its doors. Fadi is a member of several Lebanese bands, including rock groups The Incompetents and Bunny Tylers, as well as experimental trio Under the Carpet. He collaborates frequently with singer/songwriter Youmna Saba, folk bands Safar and Ramly, and is a guest player on albums by experimental duo Praed and folk singer Sandmoon, among others. As a solo artist, he has released three albums entitled “On the Rooftop Looking Up” (Self-released 2013), “Museum of Disappearing Buildings” (Self-released 2015) and “How’s Annie” (Ruptured, 2016). Maya Chami is a practitioner in graphic design and digital arts. She received a Bachelor of Science in graphic design from the Lebanese American University. In 2006, she was selected to participate in the UNESCO online masters module on art, design and technology. In 2011 she completed a Masters degree in digital arts at Camberwell College of Arts, University of the Arts London. She works in graphic design and digital arts on both commissioned and personal projects, and has participated in several design and digital arts events. Ruptured is releasing 3 new CD albums between September 6 & September 10, 2016, by three of the most creative musicians on the Lebanese alternative scene. 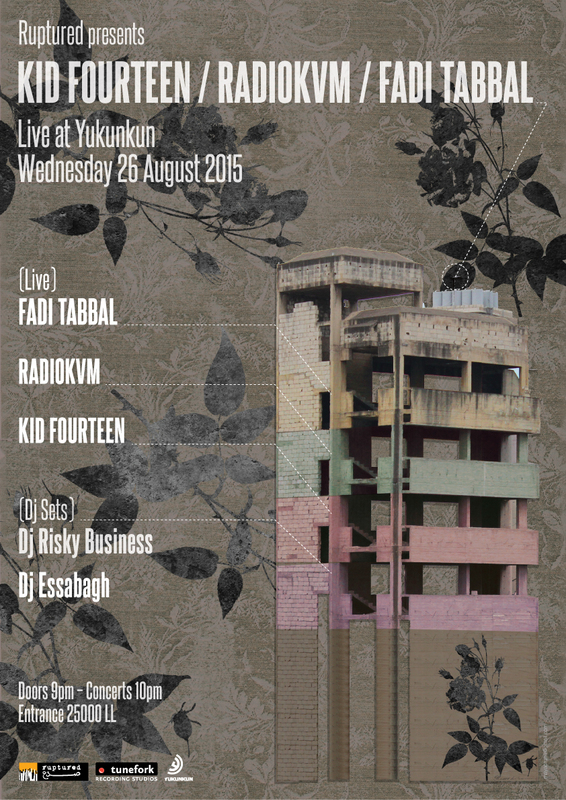 These are the first solo releases of Kid Fourteen and Mme Chandelier, and the third one by Fadi Tabbal. All three will be available in limited editions of 250 copies each. Three Voices, the latest album from Lebanese electronic artist Munma, was released by Ruptured in June 2016, in a limited edition of 300 hand-numbered LP’s. 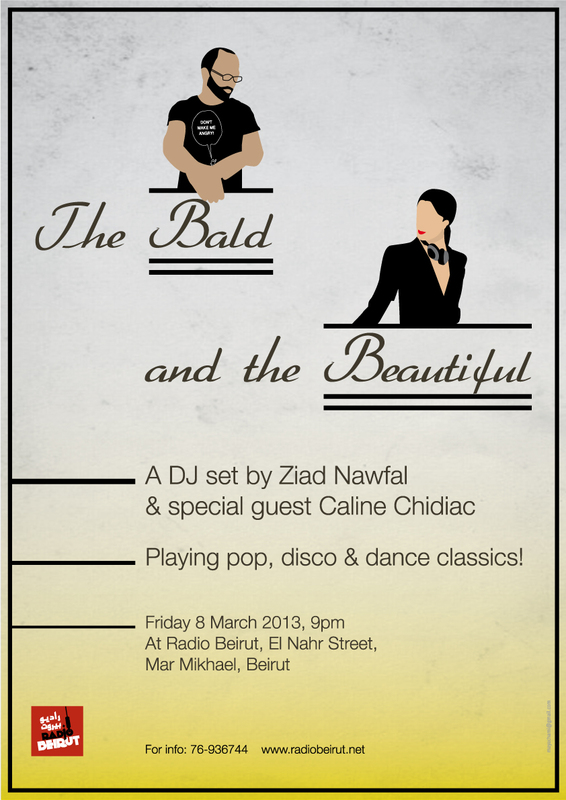 And of course in Beirut at Dawawine, Chico, and Ono Music Hub. THREE VOICES is the hotly anticipated first vinyl release from Jawad Nawfal aka Munma, a pioneer of Lebanon’s electronic/dance scene. The album will be available in a limited edition of 300 hand-numbered LP’s, including digital download codes. 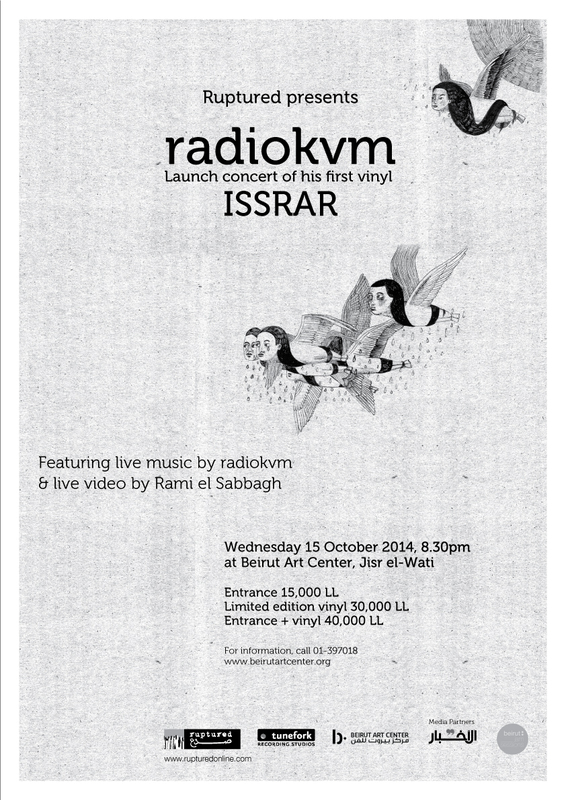 It is the second vinyl release from Lebanon’s alternative music label Ruptured, following RadioKVM’s ‘Issrar’ in 2014. Very excited to be participating in Künstlerhaus Mousonturm’s event BEYOND BEIRUT (as DJ and lecturer) next month in Frankfurt! 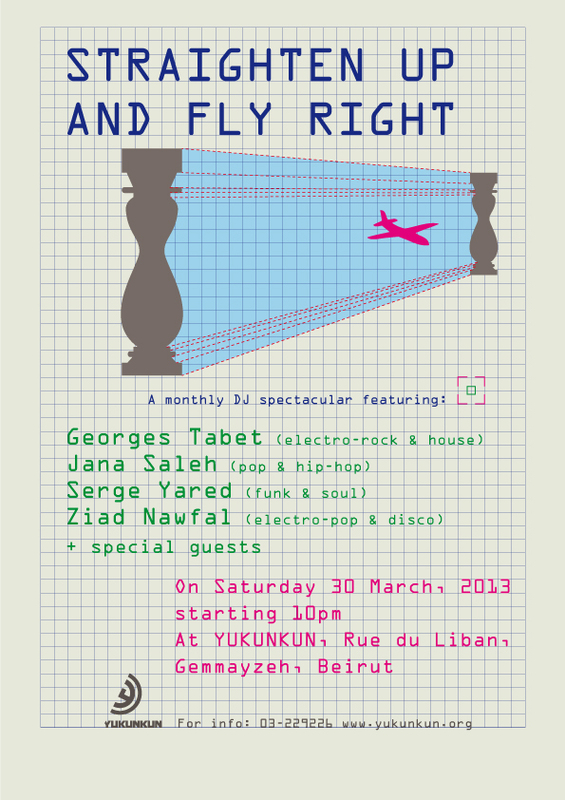 and musicians Youssra El Hawary (Egypt) and Mashrou’ Leila (Lebanon), among others. Lebanese independent label RUPTURED is proud to present 3 concerts with renowned Swiss experimental trio KOCH–SCHÜTZ–STUDER. 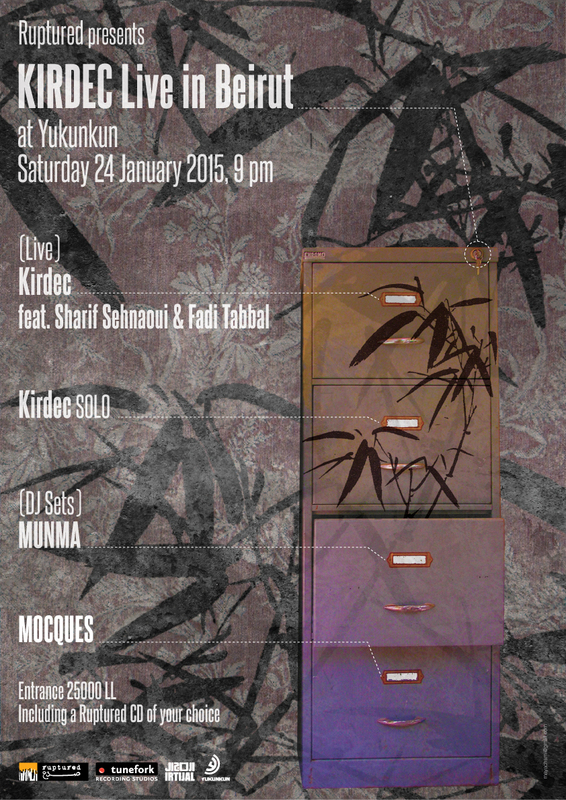 In Beirut in different venues in February 2016. Hans Koch, Martin Schütz and Fredy Studer have been working in a “style-free” musical zone since 1990, equally at ease in jazz festivals, underground rock and electronic music clubs, as well as in the context of contemporary “classical” music. In their music, sequenced sounds from various unrecognizable sources and live electronics create dense walls of sound, which are contrasted with completely acoustic, minimalistic-ambient improvisations. Besides their work as a trio, “Koch-Schütz-Studer” have initiated various projects and worked with musicians and artists from different cultural and artistic backgrounds: “Roots and Wires,” with New York-based DJs I-Sound and M. Singe; “Heavy Cairo Traffic” with renowned traditional Egyptian musicians El Nil Troop; “Fidel,” which consists of recordings with traditional and improvising Cuban musicians Musicos Cubanos. 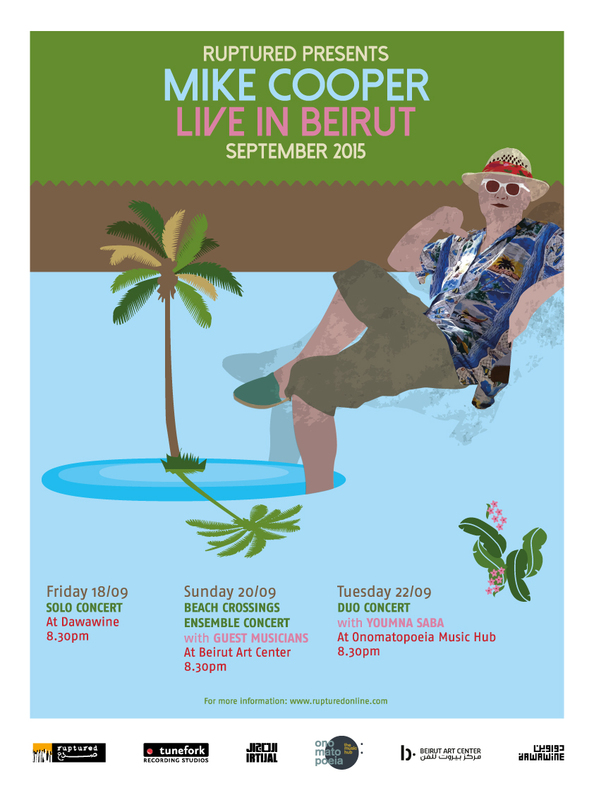 Held in Beirut in different venues in September 2015. We support the peaceful protests against the corruption and paralysis of Lebanese politics, and would like to encourage everyone to join in this historical movement. We also believe that music and arts should go on. 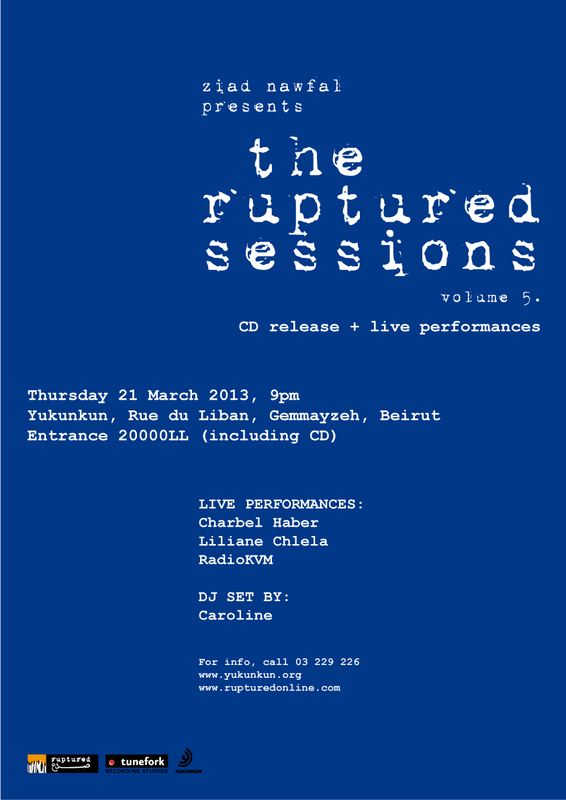 The Ruptured Sessions is a series of live recordings produced by Lebanese radio host Ziad Nawfal in the studios of Radio Lebanon. The sessions take place during Nawfal’s weekly program Ruptures, with musicians from Beirut’s alternative scene and elsewhere. Volume 5 documents the city’s younger wave of electronic composers, and features performances from the likes of Jad Atoui, Liliane Chlela, Mocques and RadioKVM. Also included are recordings from American experimental musician Robert Lowe (in his Lichens guise); up-and-coming international projects Praed and Under The Carpet; as well as an exclusive duo of Lebanese guitarist extraordinaire Charbel Nicolas Haber and Canadian sound-maker Radwan Ghazi Moumneh. 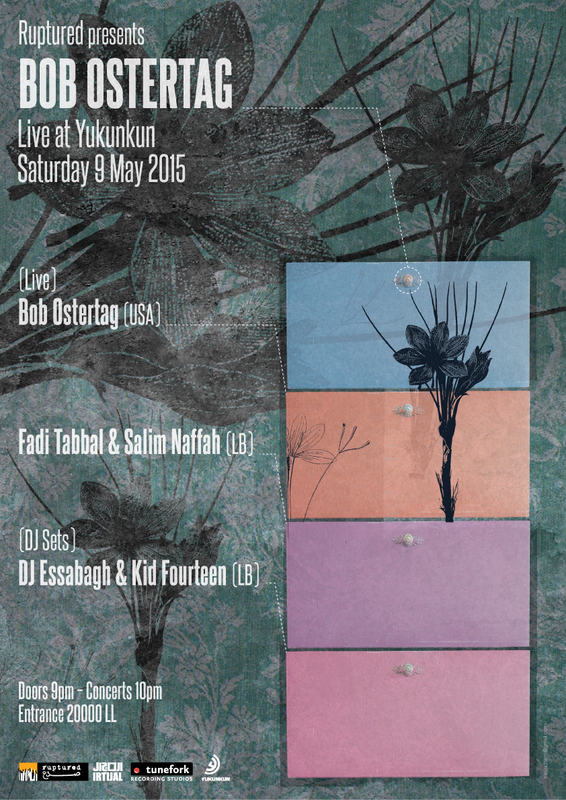 The sessions for Volume 5 were recorded in Beirut by sound engineer and musician Fadi Tabbal; and subsequently mastered in Berlin by Belgian artist and producer C-drík, who also worked on Ruptured releases El Rass and Under The Carpet. Hisstology is pleased to announce our second release of the year: “As The Suntanned Shared A Toast” by Heroes & Villains. This one was recorded by all three members of H&V (Dominique, Jeremy and Charif) in various cities spanning 4 continents in late 2012. It was compiled in Mogadishu, Somalia last month and is Heroes & Villains’ 10th album. Will not wax poetic about the theme of this LP here, the lyrics and titles speak for themselves. You can listen/download the album for free here.